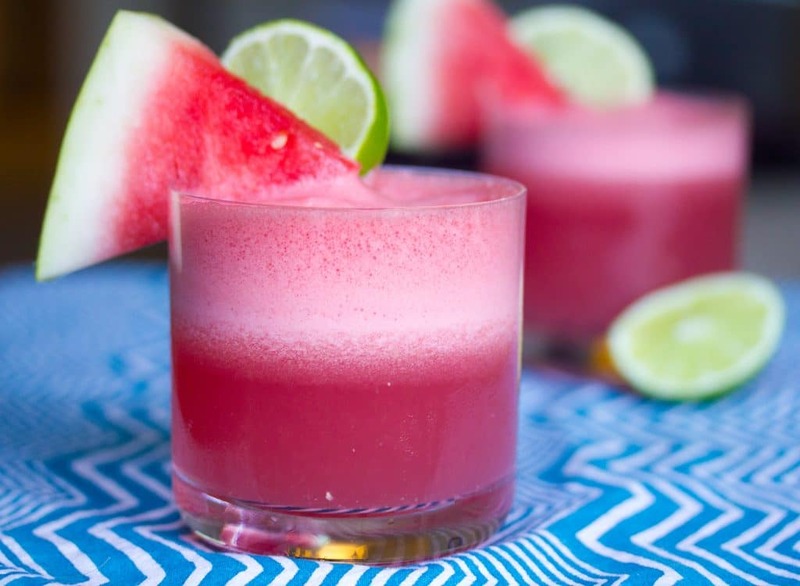 This watermelon coconut cocktail offers lots of hydration (coconut water!) and some fun, too (rum!) for the perfect summer drink. I know coconut water is, like, majorly old news by now. I mean, most of you are probably so over it and remember it like you do a bad fad from the early 90s, like troll dolls or No Fear t-shirts. You wore them with your Umbro shorts and Sambas and thought you were soooo cool. Just like you did when you were drinking coconut water after yoga while wearing your Lululemon getup last year. Oh, and then there’s the rest of you who probably never liked coconut water because, let’s face it, it’s a little weird-tasting. Well, guess what? I love it and I’m still hooked on it. And I’m currently drinking it more than ever. I still think of it as a kind of magical liquid. Whenever I’m feeling down or just a little blah, I start chugging the stuff and immediately feel better. Silly? Perhaps. But it even relieves my headaches and I’m not going to argue with that. So, for hangovers? This stuff is a godsend. And considering I’m now at an age that I can’t have two drinks without waking up feeling like I went on a drinking binge, it’s welcome in my life. So um, I guess it’s a little ironic that I’m not drinking it in cocktail form. Huh. Think of it as both the problem and the solution. In one. You can’t beat that. And you CAN have your fun and drink it, too. If that makes sense? If I have to explain it, probably not. Oh well. It’s Friday. Let’s have a drink! You guys, this watermelon coconut cocktail is SO ridiculously easy. I didn’t even take photos of the drink-making process here… Probably because I was too anxious to just get it in the glass and drink it. And because there’s just not much to the process, unless you want to see photos of me lugging my blender out of my pantry, which I’m guessing is a big nope! Though my pantry is such a mess right now, you might actually find a little bit of humor in it. You really just want a watermelon cocktail, right? So really, all you do is put all of the ingredients in the blender. My Vitamix is the best! But honestly, any blender will do. Blend everything together and serve in a glass. Garnish with a watermelon wedge and lime slice. And a wedge of coconut if you have one. Which you probably don’t. Which is why you purchase coconut water in a little carton from the grocery store. Amiright? Easy. And the color totally blew my mind. Bright and vibrant and totally summer in my glass. With a bit of froth for good measure. If you haven’t tried coconut water yet, I’ll tell you you’ll likely either love it or hate it. I wasn’t a fan the first time I tried it, but then I tried it again and got hooked. It’s super mild and just tastes like water with a touch of coconut. There’s a little bit of saltiness, too. What is not to love? Especially when combined with watermelon and rum in a watermelon coconut cocktail. I think this watermelon cocktail would be the perfect drink to sip on at a daytime party. By the pitcher. It will go fast. So, make extra. 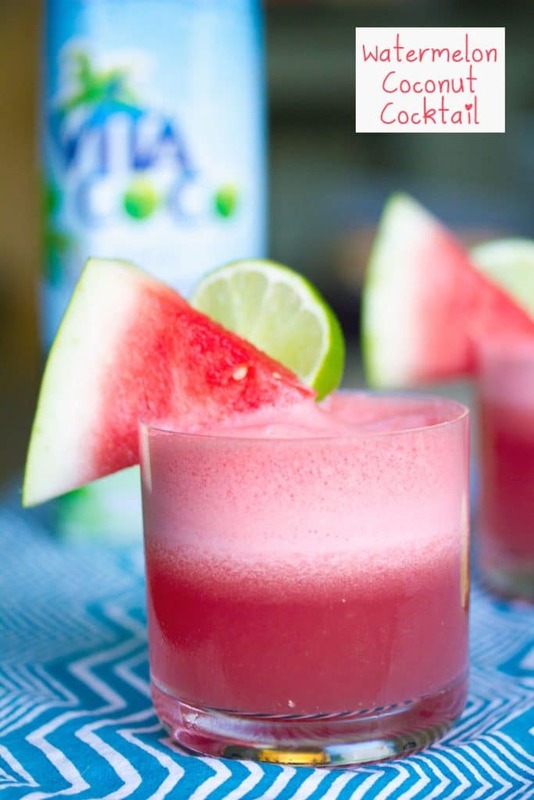 The watermelon combined with the coconut water make this drink amazingly refreshing. Which means you won’t get dehydrated and even with the kick of rum, you can enjoy a couple. Because remember… watermelon and coconut water are both fairly low calorie. And ultra hydrating. Woot. These days it seems that we have to think way too much about how something will make us feel in the morning and how many calories are involved. Oh, isn’t growing up a joy! If you love watermelon cocktails, check out my Watermelon Rosé Slushies. I also love this Shaken Watermelon and Passion Tea (it’s virgin watermelon cocktail, copycat from Starbucks!). And I can’t wait to try this Watermelon Mint Spritzer from A Zesty Bite. 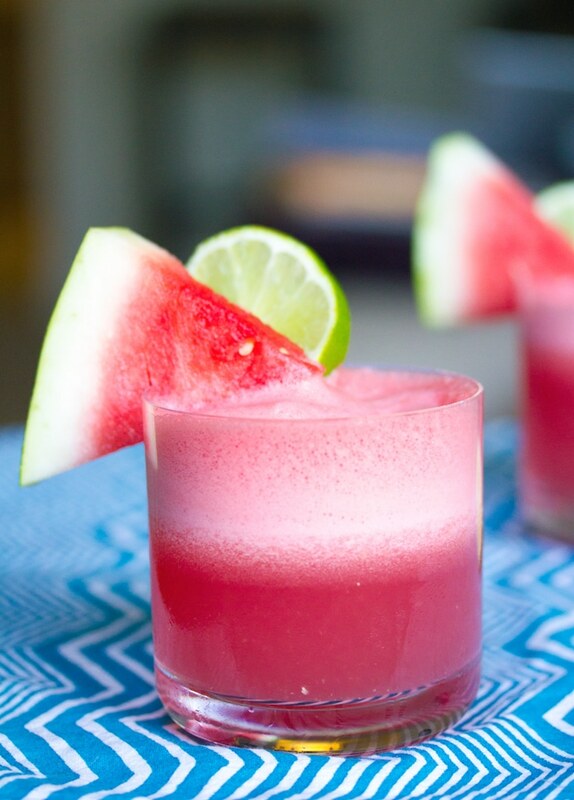 This watermelon cocktail offers lots of hydration (coconut water!) and some fun, too (rum!) for the perfect summer drink. Pour cocktail into four glasses and garnish with watermelon wedges and lime rounds, if desired. 18 Responses to "Watermelon Coconut Cocktail"
That color is wow!!! Love watermelon anything! 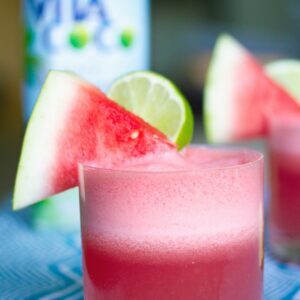 I am addicted to watermelon now and love coconut water and lime, so def have to make this, it looks and sounds so good! I actually don’t like coconut water (I’m sure I would love this drink though) but I recently tried to Coco Cafe and loved it! I started biking recently and I have to say, nothing makes me feel better after a bike ride in the heat than coconut water. I can’t wait to try this cocktail! I’m a huge fan of coconut water! I always keep bottles of Harmless Harvest (my favorite brand – tastes close to the real thing) and Coco Cafe in my fridge. This cocktail sounds so perfect for summer! I like coconut water as long as it is flavored with another fruit. I tried drinking a can of it straight once. Half way through I decided it wasn’t for me. I’ll take one on this Monday morning please! I don’t care for coconut water alone, but it sounds like I would totally drink it in this cocktail! That video is hilarious…and depressingly true. 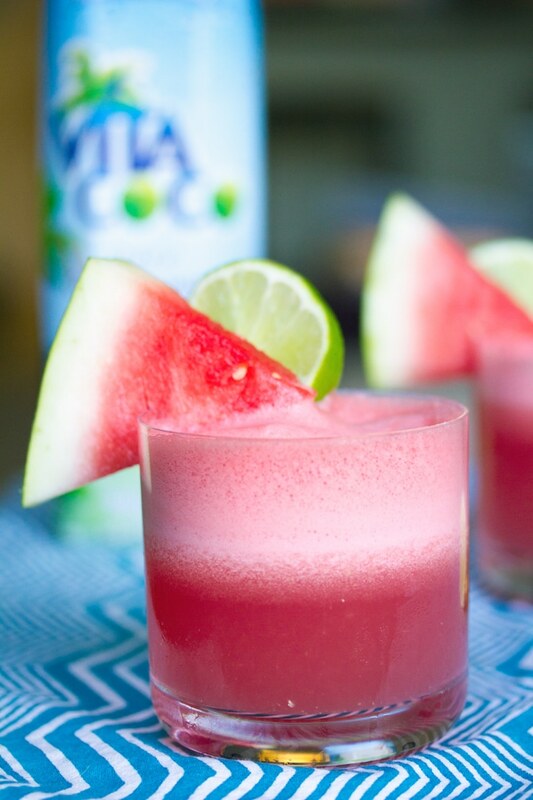 Somehow I never thought of watermelon and coconut…looks very summery! i will take one right now please! So refreshing! I love this drink (and especially because of the rum, I won’t lie). Also, that Coco Cafe stuff looks amazing. Where can I find it? Near the other coconut water? This drink looks amazing! I tried coconut water one time and didn’t like it but am willing to give it another try. Whatever happened to our idea for the “no thank you party”? That video makes me laugh every time! This sounds insanely good. I need to make it before the summer is over!